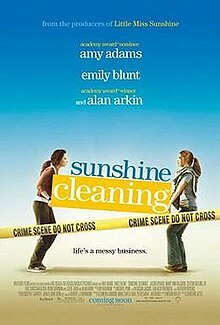 Sunshine Cleaning is a 2008 comedy-drama film directed by Christine Jeffs and starring Amy Adams, Emily Blunt, and Alan Arkin. Written by Megan Holley, the film premiered at the 2008 Sundance Film Festival on January 18, 2008. It was purchased by Overture Films for distribution and opened in limited release in the United States on March 13, 2009. The film was released on DVD and Blu-ray on August 25, 2009. Rose Lorkowski (Amy Adams) is a thirty-something single mother, working full-time as a maid. Her underachieving and unreliable sister Norah (Emily Blunt) lives with their father Joe (Alan Arkin), and is fired from her job as a waitress. Rose's hyperactive and disruptive 8-year-old son Oscar (Jason Spevack) upsets his school officials by his erratic behavior, and they order Rose to put him on medication or send him to a private school. Unable to make enough money with her current job, Rose asks Mac (Steve Zahn), her ex-boyfriend during their high school years and her married lover, for advice. Mac recommends a crime scene cleanup job, and with his connections as a police officer, he gets Rose and Norah into the business. At first, the sisters are unaware how to perform their job properly, carelessly handling the hazardous materials by throwing them into dumpsters instead of becoming licensed and properly disposing of bio-waste in an incinerator. Needing to operate as a more reputable service, the sisters get the necessary tools from Winston (Clifton Collins, Jr.), a one-armed storekeeper of a shop for cleanup material. The sisters name their cleanup business "Sunshine Cleaning" and start making progress as their reputation grows. They begin to find meaning in their function to "help" in some way in the aftermath of a loss or disaster, even though the job stirs up memories of their own mother's suicide. At the same time, the members of the family deal with their individual problems. Rose encounters some of her former high school classmates and is embarrassed by the low status of her position in life. After an encounter with Mac's pregnant wife in a gas station, where the cheated-upon wife mocks Rose's post high school life, Rose realizes that Mac will never leave his marriage, and ends their relationship. Norah meets and has a relationship with Lynn, the daughter of a woman whose house they cleaned. Joe (who makes exaggerated promises) begins to sell shrimp independently, hoping to raise enough money to buy a pair of expensive binoculars that Oscar wants for his birthday. One day, an insurance company calls for the services of Sunshine Cleaning, granting the sisters the potential to obtain breakthrough access to steady lucrative projects. Unfortunately for Rose, a baby shower is on the same day, with all her more prosperous high school classmates attending. She asks Norah to clean the house alone until she can catch up. Norah bungles her solitary cleaning assignment, as she accidentally burns down the house with an unattended candle. The house burning tarnishes their business reputation and saddles them with a debt of $40,000 which the sisters simply cannot afford. Sunshine Cleaning goes out of business, and Rose is forced to return to her previous job as a maid. Meanwhile, Joe's shrimp plan goes awry as all the stores and restaurants he approaches refuse to buy from an unlicensed food distributor. Joe had not realized when he purchased the shrimp that no legitimate business would be willing to accept the health and legal risks involved in buying food from a questionable source. Lynn breaks off her relationship with Norah as she questions whether Norah was truly interested in her at all. At Oscar's birthday party, Norah apologizes to Rose, and despite still being mad at her, Rose forgives her. The family and Winston then celebrate Oscar's birthday with Winston, who seems quite taken with Rose. Sometime later, Rose visits her father who says he's sold his house and explains that with the money, he has started a new cleanup business named Lorkowski Cleaning. He asks Rose to be his more knowledgeable managing partner and she agrees. Norah finally shows independence by going on a road trip to find her new self, while Rose starts working with her father at Lorkowski Cleaning. The movie ends on a positive note, with the implication that Norah has reached a positive turning point in her life and is at peace with herself and that Rose will successfully run her business while also looking after her eccentric father and possibly developing a closer relationship with the quietly supportive Winston. Sunshine Cleaning was produced by independent film company Big Beach. On February 26, 2008, Variety reported that it was purchased by Overture Films for distribution. It received a small-scale release on March 13, 2009. Sunshine Cleaning received mostly positive reviews from critics. Rotten Tomatoes gave it a 71% positive rating based on 152 reviews. On Metacritic, the film has an average score of 61 out of 100, based on 32 reviews. Peter Travers of Rolling Stone gave the film 3 out of 4 stars, stating "This funny and touching movie depends on two can-do actresses to scrub past the biohazard of noxious clichés that threaten to intrude. Adams and Blunt get the job done. They come highly recommended." The Los Angeles Times deemed that "on the surface, Sunshine Cleaning...is an offbeat and oddly endearing drama, leavened with just the right amount of comedy to even things out". The Times gave the film a mixed review, rating 3 out of 5 stars, saying "Given the subject matter and the sheer volume of putrefying human remains, it's remarkable that the movie still bobs along on a seemingly unquenchable current of sentimental optimism". Critics praised the performances of the cast, especially Adams. Mick LaSalle of San Francisco Chronicle gave the film a positive review, saying: "The play of emotion on Amy Adams' face is the main reason to see Sunshine Cleaning." A. O. Scott of The New York Times wrote that the film "sometimes seems better than it is" because "Ms. Jeffs (Rain, Sylvia) has a good touch with actors and a very good cast. Amy Adams and Emily Blunt...attack their roles with vivacity and dedication, even if the roles themselves don't entirely make sense." Of Adams' portrayal of her character, Michael Sragow of The Baltimore Sun said, "Adams achieves perfect clarity, with a touch of the divine." ^ "Sunshine Cleaning (2009)". The Numbers. Retrieved August 10, 2009. ^ "Sunshine Cleaning Script". Retrieved 28 January 2017. ^ Thompson, Anne; Miller, Winter (February 26, 2008). "Overture nabs 'Sunshine Cleaning'". Variety. Archived from the original on August 10, 2009. Retrieved August 10, 2009. ^ Rotten Tomatoes (December 20, 2009). "Sunshine Cleaning (2008) on Rotten Tomatoes". Rotten Tomatoes. Retrieved December 20, 2009. ^ "Sunshine Cleaning Reviews". Metacritic. Retrieved August 10, 2009. ^ Travers, Peter (March 11, 2009). "Sunshine Cleaning: Review". Rolling Stone. Archived from the original on August 10, 2009. Retrieved August 10, 2009. ^ Sharkey, Betsey (March 13, 2009). "Sunshine Cleaning". Los Angeles Times. Archived from the original on August 10, 2009. Retrieved August 10, 2009. ^ Ide, Wendy (June 25, 2009). "Sunshine Cleaning Review". The Times. Archived from the original on August 10, 2009. Retrieved August 10, 2009. ^ LaSalle, Mick (March 20, 2009). "Movie review: Amy Adams in 'Sunshine Cleaning'". San Francisco Chronicle. Retrieved June 12, 2009. ^ Scott, A. O. (March 13, 2009). "Movie Review: Sunshine Cleaning (2008)". The New York Times. Retrieved June 12, 2009. ^ Sragow, Michael (March 27, 2009). "Amy Adams is a scene-stealer in 'Sunshine Cleaning'". The Baltimore Sun. Retrieved June 12, 2009.